Welcome to the Sun Spot: Global Feel Good Center: Geng:Yin White Tiger Rrrrrrrraaaa!!!! 2010 is Chinese Geng YinYear. Geng is Metal and Yin is Tiger in Chinese Horoscope. 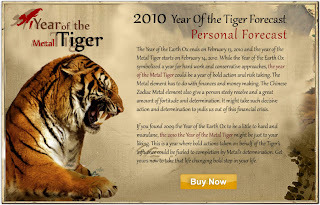 Therefore, 2010 is also calledMetal Tiger Year. From Chinese Five Element theory, 2010 is also named as the White Tiger. The 2009 Chinese New Year Day was on January 26, 2010. Chinese New Year of 2010 is February 14, 2010. It comes about 20 days late. This is because there were 13 lunar months in 2009 Chinese Lunar Calendar. The extra lunar month (Leap Month) pushed down the Chinese New Year Day about three weeks. Tigers are magnificent animals that hold an air of independence and confidence. Solitary animals, males and females come together only during the mating season. The cubs stay with the mother into their second year partly because they are born blind. To compensate for this their inner sight is fully operational. This is symbolic for those with this medicine. Children born into this medicine are natural clairvoyants and prophets. Mysticism and mythology surround this animal. The Chinese believe that the tigers head often carries the chinese "mark of wang," or king, on its forehead. This is can be seen within the patterns of its fur. One vertical line with three horizontal ones passing through it. Because of this Tiger is one of the 12 signs of Chinese astrology. Muscular, powerful and agile the tiger can travel great distances in search of food. The distance they cover depends on how much prey there is to eat. The less prey the further their territory extends. Walking on their toes with the back part of the foot raised tigers stalk their prey or lie and wait and then spring unexpectedly on them. Tigers are nocturnal hunters and hold the teachings of focus, patience and surprise. Tigers are also known for their healing properties. Their body parts are sought for use in traditional Chinese medicine and exotic herbal remedies. Their orange gold coloring symbolizes vitality and regeneration. Those with this medicine heal quickly. The tigers sight, smell and hearing is excellent. 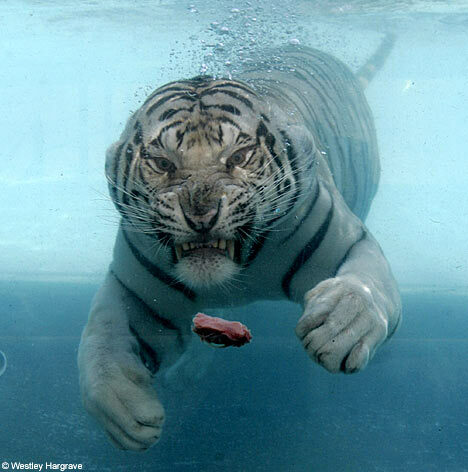 They have round pupils and yellow irises, except for the blue eyes of the white tiger. Due to a retinal adaptation that reflects light back to the retina, the night vision of the tiger is six times better than that of humans. Tiger teaches us how to see into the world of the extraordinary. Those with this medicine have a strong sensitivity to touch and make excellent body workers. Creating sacred space where others cannot enter, spending time alone in order to gather the energy required to move tirelessly throughout life is advantageous for those with this totem. When tiger appears get ready for adventure, challenge and change. The power, passion and vitality of tiger will activate the same components within yourself.